On Wednesday, the 4th of July, I began training with the International Solidarity Movement, an organization where Palestinians and Israelis, Jewish people and Muslims work together in non-violent and peaceful resistance to Israel’s illegal occupation of Palestine. There are supposed to be two full days of training, but at the end of the first day, there was an urgent situation we had to respond to. Therefore, any new recruits were invited to join, provided they felt up to it, and I volunteered myself. We travelled to the Palestinian village of Khan al-Ahmar outside of Ramallah late in the evening. 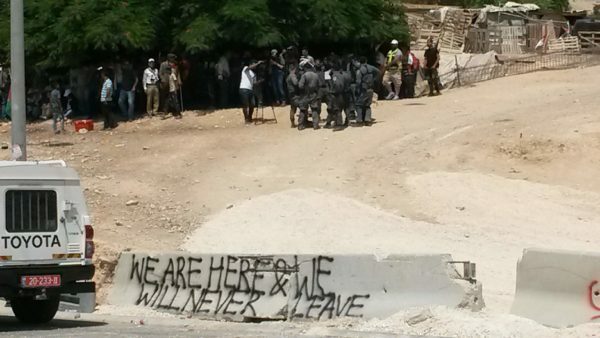 The Israeli court had ruled that the village should be destroyed and the children’s school there along with it. They were bringing in a digger to make a path for the bulldozer to come through. 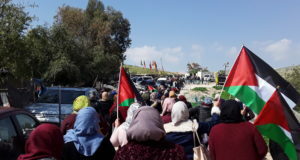 They had started the day before, and online I had seen terrible scenes of violence inflicted by the Israeli soldiers upon defenceless Palestinian women and children that were protesting the destruction of their home. We knew it would be more of the same, so we had to go there. I stayed awake all night and was on look-out, because they had arrived at 5 A.M. the day before. I smoked cigarettes and contemplated how horrific the situation was until the sun came up. 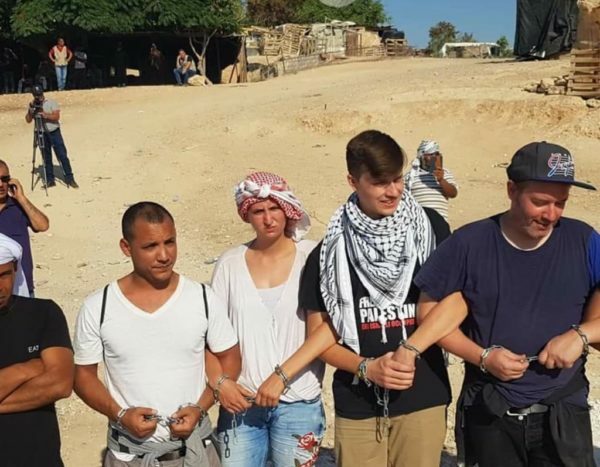 They arrived around 7.30 A.M. Me and ten other activists, one of them Israeli, made a human chain with actual chains. Our arms were linked and our hands were chained together as we saw the soldiers around us approaching, along with a huge digger. A senior soldier came over and smiled while slow clapping at us, and then went away to decide what to do about us. We went directly in front of the massive tyres on this big machine and sat down in front of it in an attempt to stop it in its tracks — which luckily worked. It’s was a very scary moment. I was at the end of the human chain, so the soldiers started with me. Three of them jumped on me, one of them stamping on my arm, almost breaking it. Another soldier came at me with a huge pair of bolt cutters and jammed it into a gap in the chain to cut it, almost cutting my thumb off in the process. In the chaos, while they were focusing on me, a brave fellow young 20-year-old American activist named Liam Wheeler actually jumped up onto the digger and chained himself to it. At this, the Israeli soldiers went crazy and jumped all over him, yanking him away with everything they had while he was chained. Again, they could have broken both his arms but luckily, he only got a sprain on the inside of his elbow while mine is just bruised and tender with the skin still healing. They dragged us over to their vans and trucks. I’d heard another one of our young activists screaming so I knew they had done something to her. It turned out she had been arrested as well. This was the 21-year-old Canadian Michaela Wheeler. 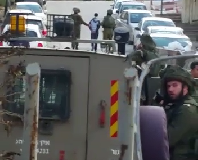 Up against the truck, one of the soldiers tried to snap my thumb back. Once arrested, we were calm and peaceful, so this was just to put me through pain. My thumb went back as far as it could without snapping and was held like that for about a minute while I just stood there in pain. An older, senior soldier came over to me and started shouting. I told him were peaceful people and that this was a non-violent and peaceful protest against the demolishing of these people’s and their children’s homes. He looked me dead in the eye and said, “YOU’RE PEACE, I’M WAR”. They then humiliated us. The soldier who arrested us proceeded to drag us one by one, bruised and shaken, our hands bound with cable ties which my wrists were bleeding from. Meanwhile, all his friends got in a circle around us, took out their smartphones and commenced to photograph us while laughing. It was like an animal trophy hunting shot. I could take it, but seeing it done to these 20 and 21 year olds cut me pretty deeply. They then forced us into the back of a van. Not in the back seats, but down on the floor with virtually no spare room, so we were basically in the fetus position. They kept us like that for an hour. At this point my nerves started to go a bit. I looked to the left of me and the saw these brave young people taking it in their stride and remaining dignified. I drew inspiration and strength from them. I then saw the digger go straight through into the village, before they took us to a police station in the nearby illegal settlement. They then cut the cable ties, which had been fastened as tight as they could so they cut our wrists and had slowly began cutting off my blood circulation. Quite remarkable given the fact that we hadn’t been difficult with them, just calm and still. However, we still got thrown around. They then sat us in a room with them all around showing each other the videos of everything that had happened, they were just laughing and loving it. After a few hours of the same of thing they put us in a cell, me and Liam together and Michaela in the next one. The cells, as disgusting as they were, weren’t as bad as the treatment we received. They starved us of water throughout the whole day. Internationals in this heat need around 2-3 litres of water a day, but they would give us one tiny plastic cup, nowhere near enough to quench our thirst, and then we would have to beg for an hour or two before we would get another tiny plastic cup. I probably had just five of those from about 9 A.M. up until 9 P.M. Throughout this time our interrogators were always trying to make us sign things, sometimes in Hebrew, which we didn’t understand. I later learned they would have used this to expedite the deportation orders of us back to our homes. Israel doesn’t want internationals here who are even sympathetic to what is happening to the Palestinians, let alone people who stand by their side. As it approached 8 A.M. and getting dark outside our cell window, we got worried about where our lawyer was. We reasoned with ourselves and held firm, trusting that our case was being worked on. Around an hour later there was a bang on the cell door. This time they said that our lawyer was here and took Liam out of the cell. 10 minutes later, they switched us and there was an amazing Jewish Israeli Human Rights lawyer waiting for me. She explained that she had been on the case for us all day and was planning to meet us in court the next morning, telling us that they were planning to deport us. This was our biggest fear. She said my consulate was putting pressure on Israel to allow them to visit me, using that to complicate things for them and delay them moving us to the Russian compound. In the nick of time, another Israeli supporter of Palestine signed something for us in Tel Aviv and with that we were being released. I couldn’t believe it, relieved that now we could stay and do more work. If they had decided to deport me, it might have taken a day or two and I could have ended up missing England’s World Cup Quarter Final game against Sweden! They took me back to the cell and I shouted to Michaela that were out of here. We were all really relieved, but as international activists, we must be prepared to stand alongside the Palestinians when Israel are committing these crimes, and yes, that means we must be prepared to be arrested when necessary. 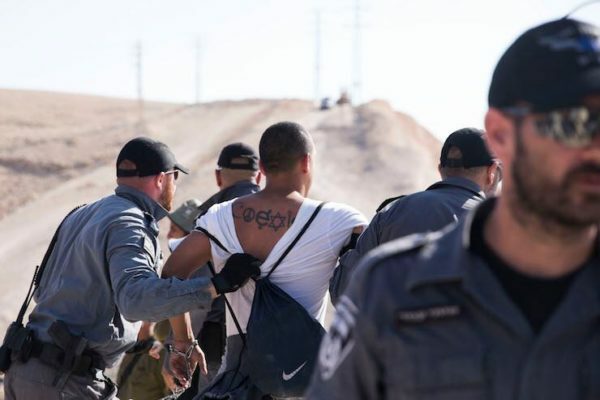 For us internationals, we can be sure that we will appear in front of an Israeli court judge within 24 hours, and the worst thing that can happen is that we get deported. 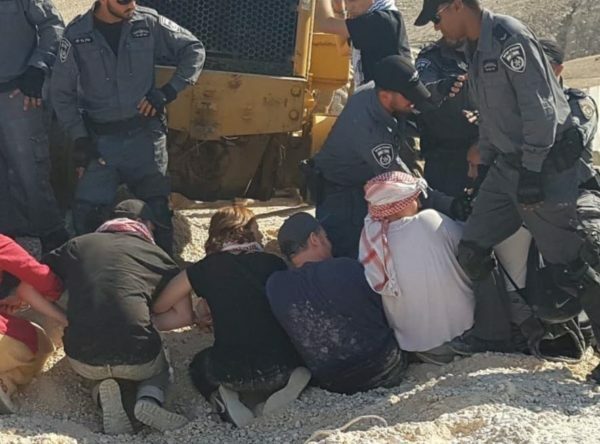 However, when a Palestinian gets arrested for the same thing: protesting against the destruction of his house, his water supply, his land or lack of free movement, whatever it might be, that’s it — he’s gone. It could be a year, or it could be five. We must stand firmly in solidarity with Palestine and the Palestinians. We must pressure our governments to stop selling arms to Israel and to recognise Palestine as a full UN member state. I wish Israel would say “OK, we have enough land now”. But they keep expanding the settlements, it never stops. It’s time to take a stand. 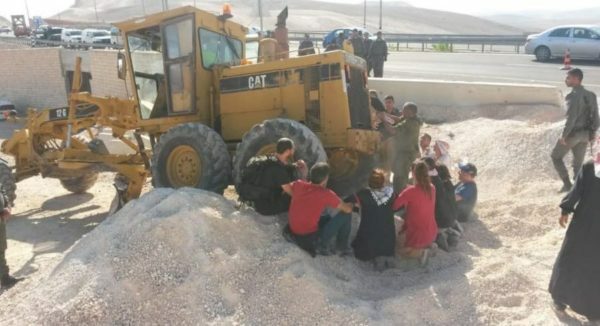 Upon going back to Jerusalem with my fellow activists and then on to Bethlehem not far from the beautiful Church of Nativity, I found out we had won a temporary injunction from the Israeli High Court against the destruction of Khan al-Ahmar village. I was elated, as this will hopefully allow for more international activists and media to gather and bring attention to the case. These are just small examples of what Israel is doing and how they’ve occupied almost the entire country of Palestine with systematic repression and brutal force. It’s important to remember that one side has all the power, all the money and all the guns and artillery, and that the other side is near defenceless. 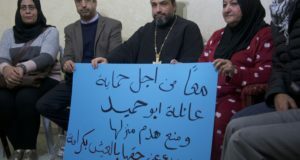 I appeal to international activists to join the Palestinian cause now, to come over and get involved. If activism isn’t for you, then take a non-activist and perfectly safe trip to Palestine, both to learn, and because it’s a beautiful place with some of the most kind, helpful and caring people I have ever met — and I’ve been to many places.